The Prime Minister of Azerbaijan is the head of government of Azerbaijan. The current prime minister is Artur Rasizade. In case of the President's death, resignation or impeachment, the Prime Minister becomes a temporary president until new presidential elections which must take place within three months. The Prime Minister acting as president may not dissolve the National Assembly, announce a referendum or propose amendments to the Constitution. Authored the Azerbaijan Economic Progress Program and Main policies of Cabinet of Ministers program; Laid the foundation of Azerbaijan's Economic Independence Concepts and Agricultural Reforms Program; Established the Assistance Fund for Refugees and IDPs. Declared Sumgait a free economic zone and signed a contract with foreign oil companies for exploration, development and production at Karabakh oil field. ↑ Fuad Akhundov (Spring 1998). 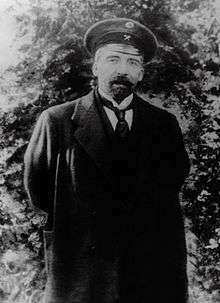 "Alimardan Topchubashev - Minister of Foreign Affairs (1862-1934)". Azerbaijan International. p. 31. Retrieved 2010-07-09. 1 2 "Ministry of Finance of Republic of Azerbaijan. History of the ministry". Retrieved 2010-11-08. ↑ "Presidential Library. Nariman Narimanov" (PDF). p. 72. Retrieved 2010-07-09. ↑ "Gazanfar Mahmud-ogly Musabekov (Газанфар Махмуд-оглы Мусабеков)". www.archontology.org. Retrieved 8 November 2014. ↑ De Waal, Thomas (2003). Black garden: Armenia and Azerbaijan through peace and war. New York and London: New York University. p. 138. ISBN 0-8147-1944-9. Retrieved 4 May 2010. ↑ "Vaşinqton Post: "Şərqin İbn Sinası doğuldu"". 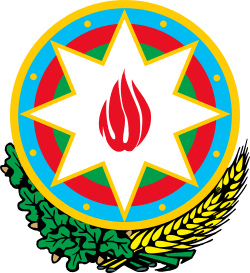 bugun.az (in Azerbaijani). Retrieved 8 November 2014. ↑ "Mir Cəfər Bağırov və Teymur Quliyev". www.anl.az (in Azerbaijani). Retrieved 8 November 2014. 1 2 3 4 5 6 7 Азербайджанская ССР. datarule.narod.ru (in Russian). Retrieved 8 November 2014. ↑ Как это часто бывает, и коллеги были разные…. www.sultanov.azeriland.com (in Russian). Retrieved 8 November 2014. ↑ Lewis Siegelbaum. "Seventeen Moments in Soviet History. 1973: Shakeup in the Republics". Retrieved 2010-05-03. 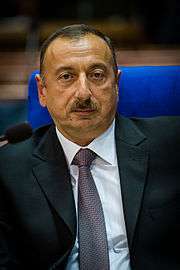 ↑ "Exiled Former President Returns To Azerbaijan For Son's Funeral". www.rferl.org. Retrieved 2 August 2014. ↑ "Ministers of Foreign Affairs of Azerbaijan. Hasan Hasanov". Retrieved 2010-07-06. ↑ Goltz, Thomas (1998). Azerbaijan Diary: A Rogue Reporter's Adventures in an Oil-rich, War-torn, Post-Soviet Republic. M.E. Sharpe. p. 142. ISBN 978-0765602442. ↑ "Speech of Heydar Aliyev on social economic progress". Retrieved 2010-07-01. ↑ Dawisha, Karen; Parrott, Bruce (1994). Russia and the new states of Eurasia: the politics of upheaval. New York: University of Cambridge. p. 192. ISBN 0-521-45262-7. Retrieved June 30, 2010. ↑ "Directory of Biographies. Ali Masimov". Retrieved 2010-06-25. ↑ Betty Blair (Autumn 1995). "Diplomatic Interview. United Nations Development Program (UNDP) Representative by Paolo Lembo". Azerbaijan International. pp. 62–63. Retrieved 2010-06-25.